Our sweet couple - Kerrigan & Caramel we have been planning this mating since Kerrigan was born. We think these two will supplement each other so well. Booked = The kitten is probably sold, a booking fee has been payed. Our goal is to breed healthy, strong built cats according to the FIFé standard of Norwegian forest cats, and the temper is our top priority. The most imporant for us, is that the cat will be a nice familypet. Our kittens will be used to an ordinary familylife, with children in different ages and other cats. *Health-certitficate(not older than 7 days). *Deliverance between 12-14 weeks of age. 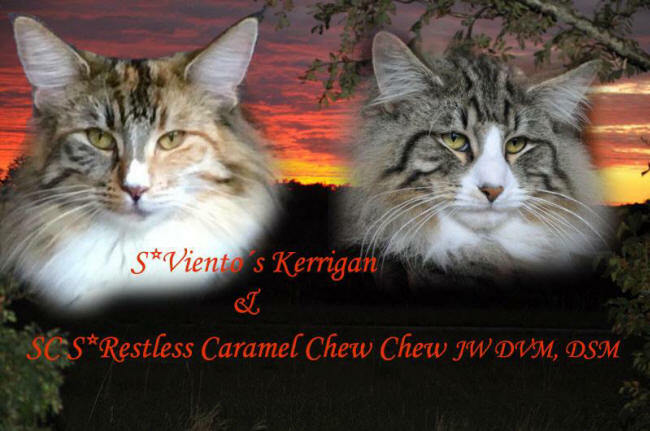 You are welcome to contact us, if you are intrested of buying a kitten from S*Viento´s. No kittens will be sold, without personal contact, but e-mail work great as a first contact. If the buyer is long distance, we will work it out together.